Kodagu-born M.R. Poovamma, winner of the 2015 Arjuna award for her contributions in the field of athletics, is the ‘Coorg Person of the Year, 2015”. Machettira Raju Poovamma, aged 25, won the gold medal in women’s 4 x 400 metres relay at the 2014 Asian Games in Incheon, South Korea and clinched a silver in 400m race in the Asian Championships at Wuhan, China in June 2015. 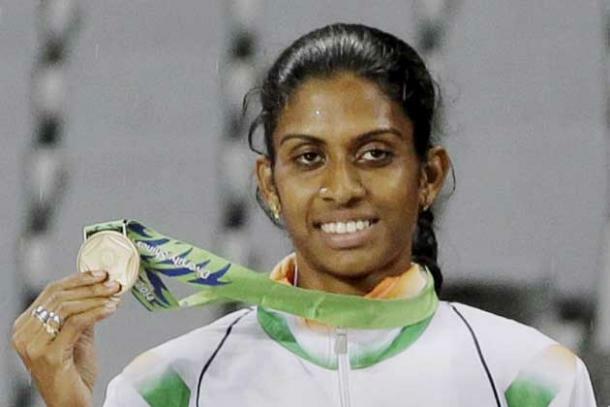 Poovamma, who participated in the 2008 Beijing Olympics and is currently ranked No.2 in Asia in the 400 meter category, was selected ‘Coorg Person of the Year’ in a poll conducted by www.coorgtourisminfo.com, Kodagu’s first news portal, promoted by senior journalist P.T. Bopanna. Poovamma, who participated in the Beijing Olympics 2008, is the daughter of M. G. Raju and Jaji. She completed her primary and higher education in Mangaluru and acquired her Bachelor’s degree in business management from SDM College of Business Management, Mangaluru. Among the others who were nominated for this year’s ‘Coorg Person of the Year’, include Kokkalemada Manju Chinnappa of the United Kodava Organisation, who led a padayatra from Talacauvery to Bengaluru to draw the Karnataka government’s attention to the many social and environmental problems that affect Kodagu. The past winners of the ‘Coorg Person of the Year’ are Dr Kavery Nambisan, novelist, 2005; Dr Boverianda Nanjamma Chinnappa, researcher, 2006; Robin Uthappa, cricketer, 2007; Dr Moodera Jagadeesh Subbaiah , scientist, 2008; Air Marshal K.C. Cariappa, Retd., environmentalist, 2009; Tennis player Rohan Bopanna, 2010;retired Tamil Nadu IAS officer P.M. Belliappa, 2011; Vineet Devaiah, technology innovator, 2012; birdman Dr S.V. Narasimhan, 2013, and Joshna Chinappa, winner of the gold medal at the last Commonwealth Games in women’s squash doubles, in 2014.